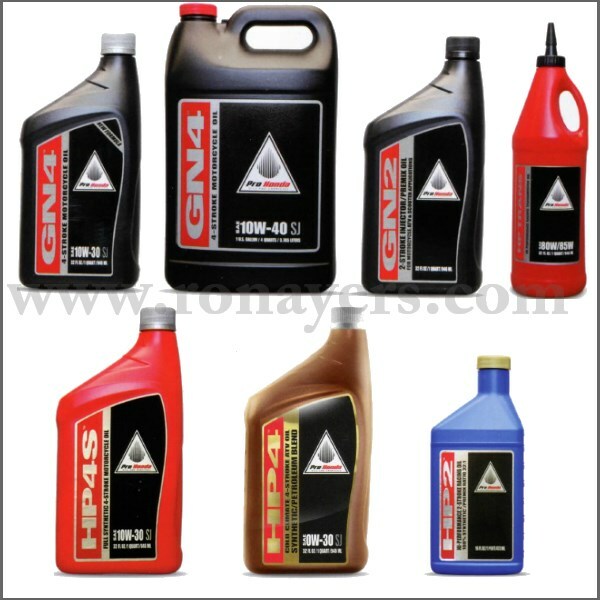 Pro Honda GN4 Honda set the standard for motorcycle oil when it introduced GN4 in 1975. Specifically designed for the unique requirements of motorcycle and ATV engines. Pro Honda HP2 is simply the finest two-stroke oil money can buy. Allowing a crisp 32:1 mixture ratio, this extremely clean-burning formula minimizes carbon deposits, extends spark plug life, and reduces maintenence on Honda Power Port and ATAC systems. Pro Honda GN2 This is the only oil that has been tested and approved by Honda R&D for use in all older liquid-cooled and air-cooled two-stroke Honda Motorcycles, ATV's, and Scooters. Clean burning formula reduces exhaust smoke and carbon build up, and helps prevent against rust and corrosion. Pro Honda HP Trans Oil Specifically for CR and FourTrax 250R, and CRF four-stroke transmissions. Prevents frothing, and offers ultrahigh film strength.